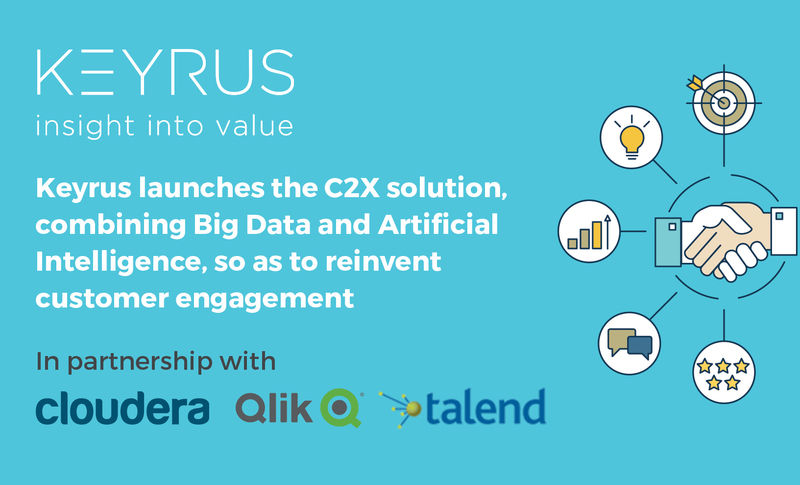 Keyrus announces the launch of its Customer Experience Excellence - C2X – solution in partnership with Cloudera, Talend, and Qlik. According to Forrester*, 72% of organizations believe that personalizing the customer experience will be their main driver of differentiation. A real technological catalyst, combining Big Data, Artificial Intelligence, and smart visualization, the C2X solution enables General Management and Commercial and Marketing departments to test and implement indicators that generate business. By combining the power of Big Data and of the Cloudera platform's Analytics, Talend's data integration functionalities, and the visual analysis power of the Qlik Data Analytics platform, Keyrus has created a solution offering a unique value proposition through a customizable package coupled with agile execution methods. The C2X solution is a seamless, "all-in-one" Big Data package that works for all known and future customer contact points (call centers, branches, digital…) and can easily be integrated into the portfolio of existing applications. Capable of being up and running within just a few weeks, the solution allows organizations to focus on their commercial development. Thanks to C2X, companies can put in place offerings that are personalized according to the purchasing behavior of each customer. These "tailor-made" offerings are devised on the basis of recommendations generated through Artificial Intelligence. The use of AI provides a better understanding of the customer's needs and makes it easier to identify appropriate moments to engage with them. In this way, C2X enables Commercial and Marketing Departments to make suggestions to their customers as part of a strengthened relationship of trust, founded upon a better understanding of their expectations. "Our intention was to work with the market's leading technological players to package a solution for personalizing the customer relationship that was quick to implement and appropriate. Indeed, this solution can be easily deployed and configured", indicates Benoît Bourdé, Solutions Director at Keyrus. "C2X brings together a set of technologies that have been tested and approved by our experts, as well as Keyrus's recognized consulting know-how, so as to allow organizations to focus their energies on drivers that generate business, without wasting time on the technical side". The C2X solution has already been deployed within APRIL Technologies, a company in the APRIL Group that delivers suitable IT solutions to the Group's companies to support their business lines. "The benefits flowing from the C2X solution deployed within our entity have been threefold", comments Denis Bourdon, CEO of the APRIL TECHNOLOGIES Economic Interest Grouping. "The first was adopting technologies forming the basis for Big Data projects. The second was accomplishing an initial use case that creates value for the business lines and will allow APRIL Technologies to be the ambassador for Big Data solutions within the APRIL Group. Finally, the third was building a technological platform, since this is both the essential first step and basis for our future Big Data projects".